I was tipped off to this photo being posted on facebook and was able to get permission to share it. Got some great bonus material as well, which you can check out below. I love seeing classic photos like this! At first, I couldn't place this store in my head even though I knew it was in the Andorra Shopping Center. The place looks completely different today, which you can see below. The new top-heavy facade makes the store appear smaller from the outside than the previous facade. 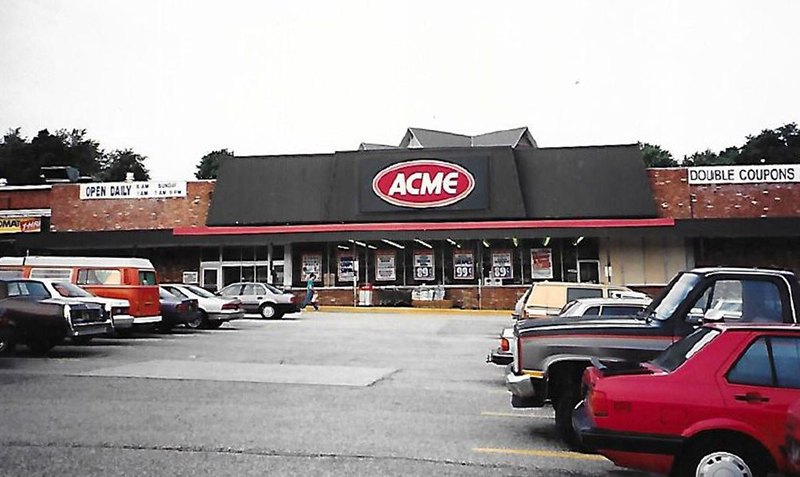 That said, this store's exterior upgrade is one of the nicest we've ever seen on a classic Acme! 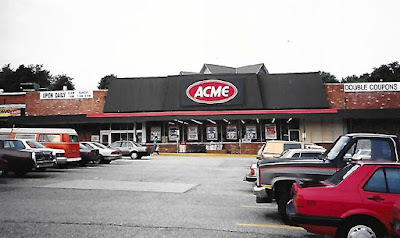 The Ridge Avenue Acme was covered on the blog back in 2011. Not much has changed since then other than the aisle markers getting switched out with the PF&H version 3 signs and some case upgrades. In fact, not much has changed here since the day the store opened. The layout has been preserved for decades with the only major change being the addition of an in-store Bakery during the 80's Remodel. 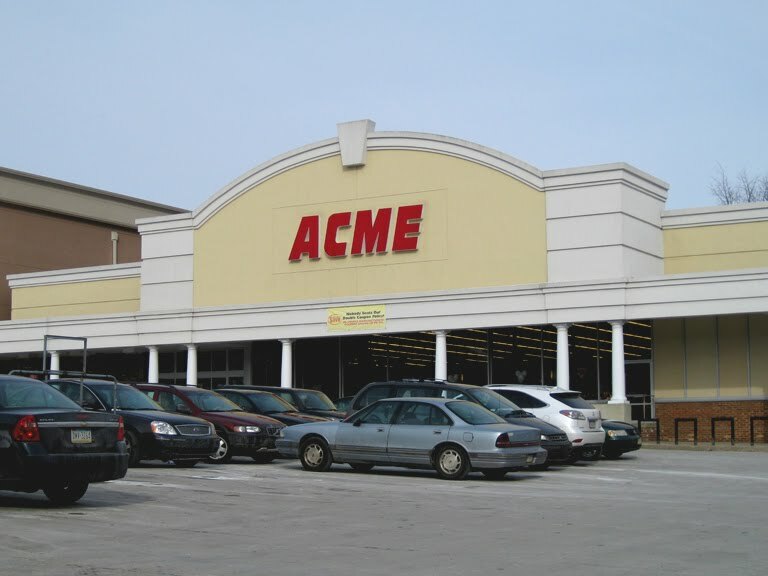 It's one of the most classic Acmes still in existence today! You can enjoy an updated tour of the store on catnapped retail central's flickr photostream by clicking here. 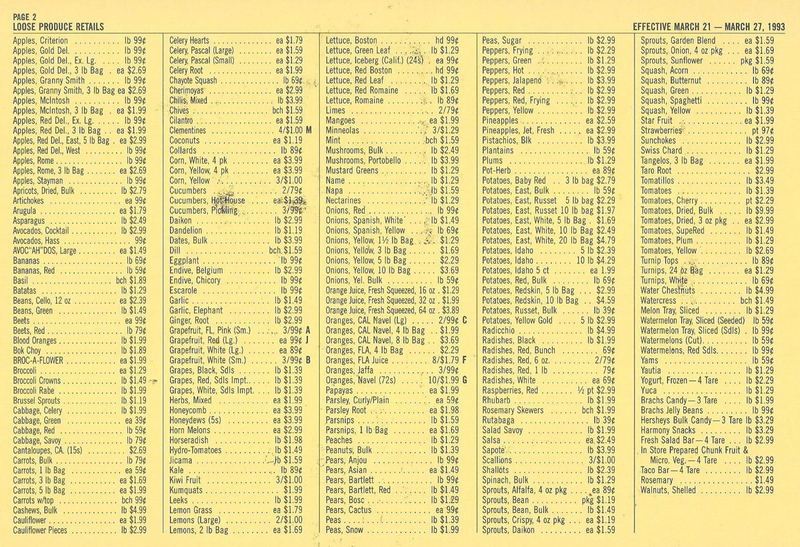 Price look-up charts for the registers! These are from 1993. 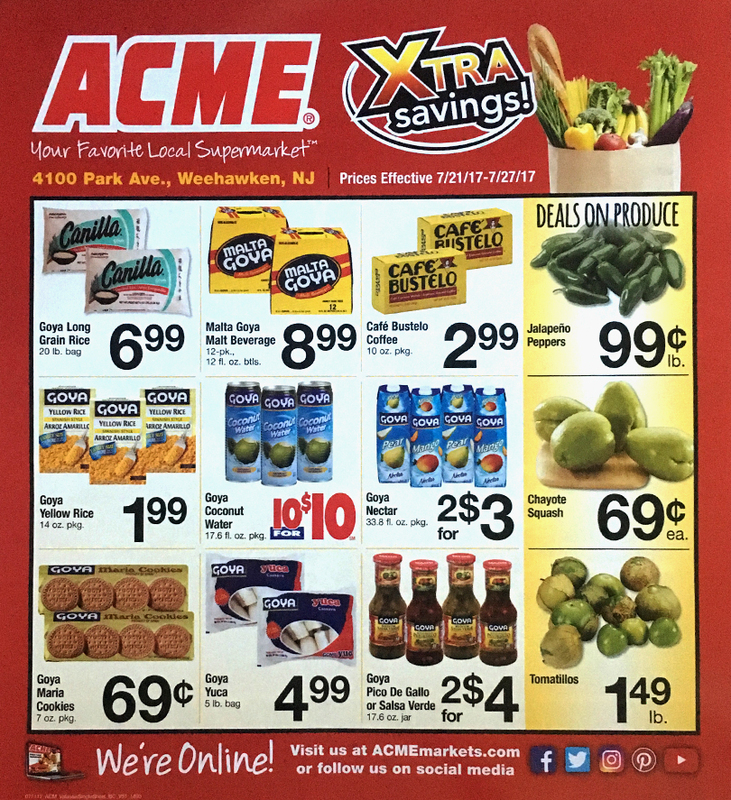 I don't recall my Acme ever having charts with the actual weekly prices on them although my check-out days were over by 1993. Thanks to Chris for the photos! Tea: One brand. Never heard of it. Cereal: Golden Grahams! And a few Acme brand items. Crackers: A few Acme brand items. 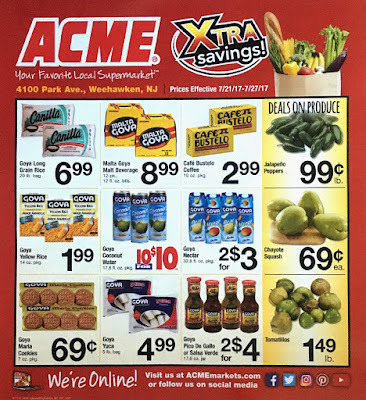 Peanut Butter and Jelly: A few Acme's Open Nature only. Granola Bars: One. 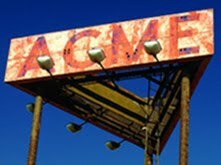 Acme's Signature Brand item. Spagetti Sauce: NONE except for Rao's which is still at the same "new low price"/yet higher than everyone else, since the 2015 campaign. Canned Vegtables: One. Del Monte canned Zucchini. Get 'em which they last! Pet aisle: TONS! Oh wait. Just on Acme's Priority Pet products. Laundry: One. Acme's Bright Green Laundry Detergent. Entire Baking Aisle: Acme's Signature Kitchen oils only. Frozen Dinners: A good 10 to 15 items! Wow!! Frozen Breakfast: Eggo brand only. Orange Juice: One. Acme's Signature Brand single serve bottle. Dairy: Handful of Lucerne Brands. No national brands. Baby: A few on Acme's own Mom to Mom brand. 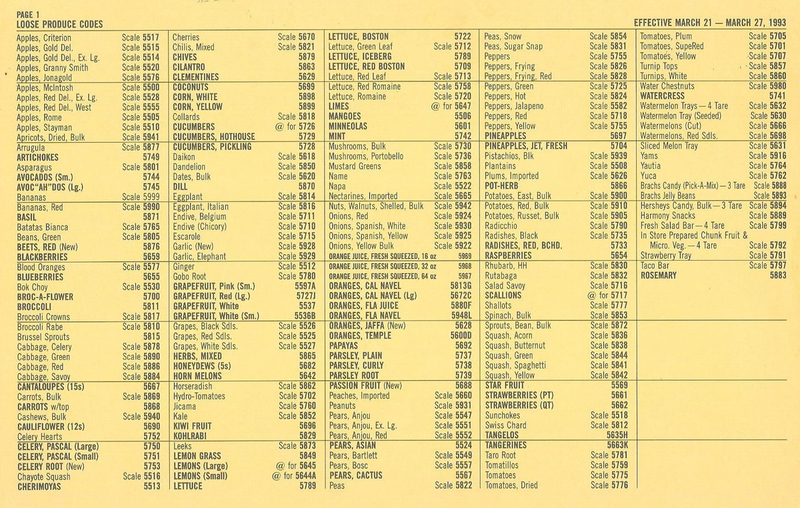 Again, this list is from my own personal observation as a regular and loyal Acme shopper. And it's not to say that I didn't see tons of sales tags up and down every aisle. 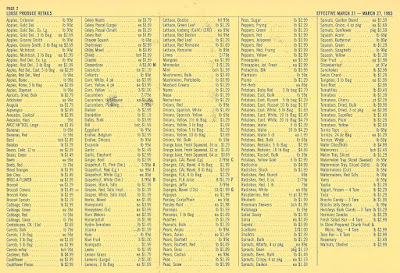 But "New Low Prices" were tough, if not impossible, to find especially on national brands. 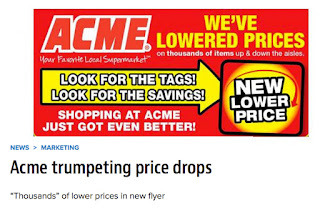 Very disappointing since Acme's last two rounds of lower prices got off to decent starts. I found only one item that I buy regularly to have a "New Low Price". Problem was... the price wasn't "new". 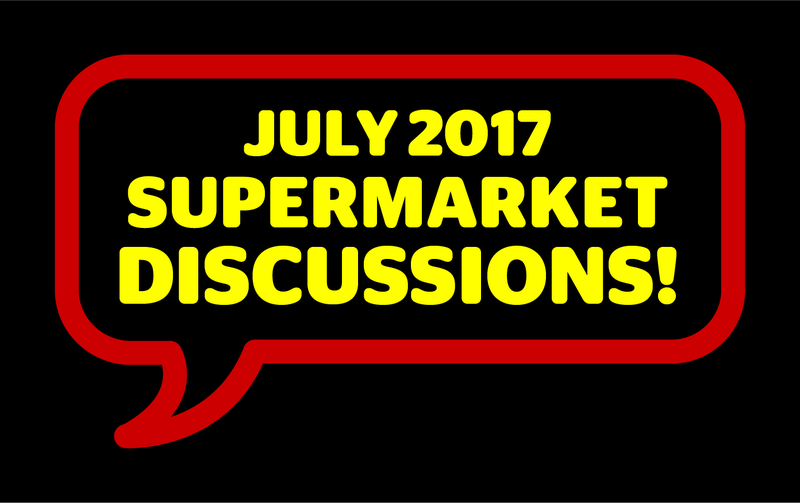 It was the regular price Acme was charging for months before the insane wave of price increases that hit at the end of 2016. Things are looking much better for week #2! Wow, what a difference a week makes. Now the "New Low Price" signs are up and down every aisle. Spotted tons of them in Health & Beauty after I wasn't able to find one during the first week. 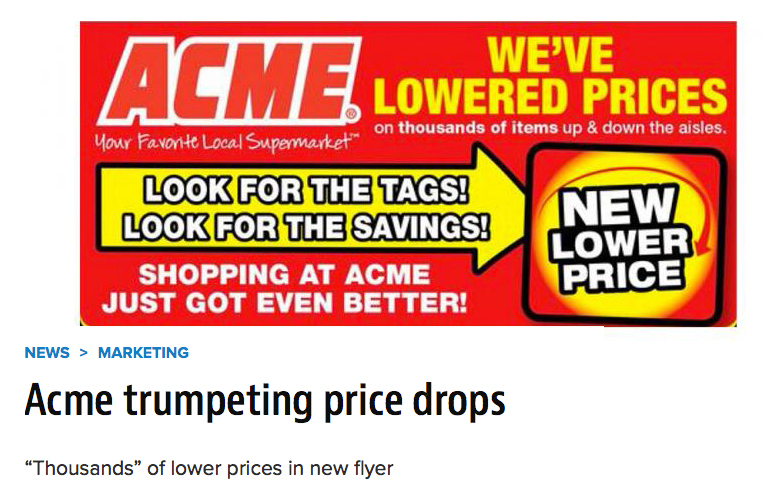 Strange how Acme launched the promotion before there were so few new low prices for shoppers to find. 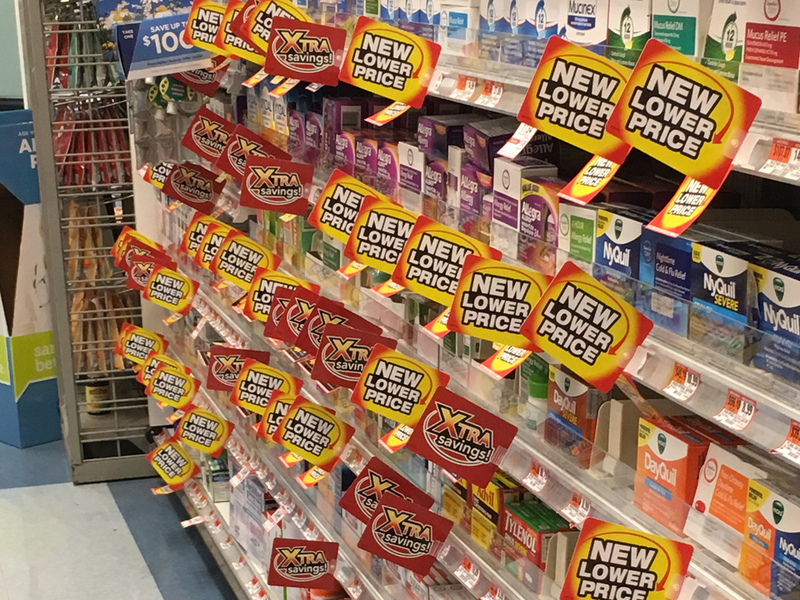 These new shelf tags began appearing about two weeks ago indicating that Acme was on the verge of another "low price" campaign. They were, and the campaign officially launches today! 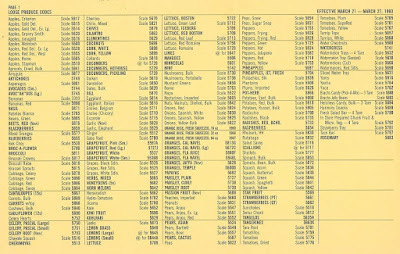 Funny thing though, I took a quick stroll through my local Acme yesterday and couldn't find one of these tags anywhere. Not sure why they seemed to have disappeared. Perhaps the big push for the tags was happening this morning just before the new circular went into effect. I haven't been able to judge for myself the legitimacy of the new lower prices. Not a single item I buy regularly have had one of these tags. 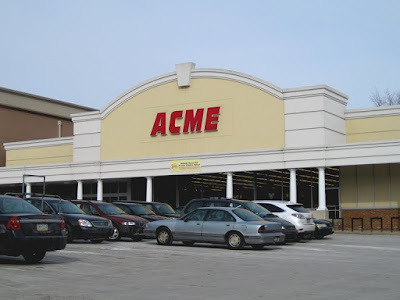 I'll be sure to stop in an Acme today to see if I have better luck! This is the front page of the outer wrap for this week's circular. 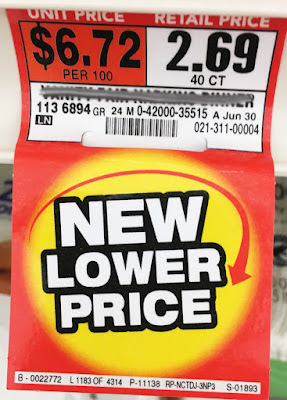 Let's hope this Acme sticks with this longer than they did with the last round of "new lower prices" that began back in late 2015. If you blinked, you missed it and then prices shot through the roof as 2016 wore on. 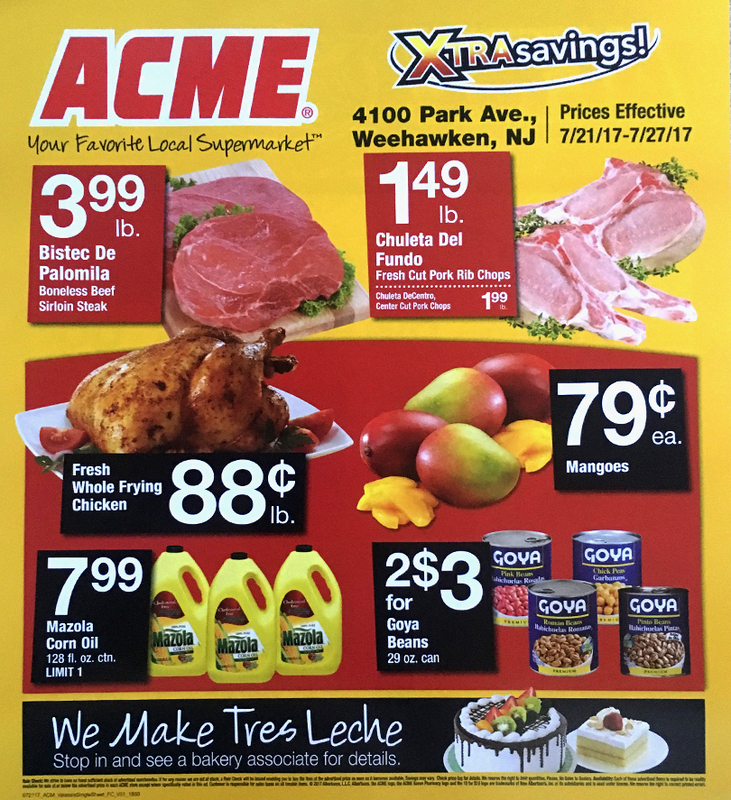 The Weehawken store has been getting its very own ad for the past month. I'm sure this same ad is being used at other stores located in ethnically diverse areas but it's nice seeing the store's address printed on both sides of the ad giving it a very customized feel. I wonder if this new approach may have been started to prevent another crash and burn situation like the recent closing of the Newark, New Jersey store. Like Newark, Weehawken's variety of ethnic products have taken a big hit since the Pathmark days. I'll be covering the reset of the store in an upcoming post. Did any catch Acme's INSANE ice cream sale two weeks ago? All pint-sized ice cream was on sale for $2.88 each, all week long! I can't remember the last time I saw Haagen Dazs or Ben and Jerry's priced that low at Acme or anywhere else for that matter. The sale included every single brand including Talentie Gelato and the high-priced, new protein rich ice creams like Halo and Enlightened. Then to make it even crazier, Acme kept Ben and Jerry's, and Talenti on sale for $2.88 for a full second week! Unbelievable. Acme's new low price campaign! "The campaign, which will mark the reduced items with tags in store, is among the first visible changes since Jim Perkins returned to his previous role as president of the Malverne, Pa.-based brand. As previously reported, Perkins, Albertsons’ EVP of special projects replaced Dan Croce as Acme’s president last month in a move an Albertsons spokeswoman said would assist former A&P stores and employees transition to Acme’s system." 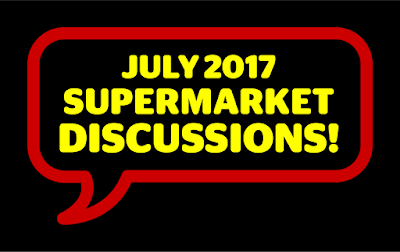 "Sources have said that some of the 70-plus A&P stores acquired by Acme in late 2015 have not performed to expectations."